When I was in high school, through the combined experiences of youth group, being on the Ashland District Youth Council, and participating in a summer work-camp called Richmond Metro Workcamp, I began to experience a call to ministry. I don’t remember sharing it with others. But it did reach a point where they shared it with me. It all became very real when the pastor of the small United Methodist Church where I grew up asked if I had ever thought about going into the ministry. As I finished high school, I was much more comfortable with the idea that God was calling me to ministry. But, doubt would creep in. I would go to community college and get an Associates Degree in Early Childhood Development. I envisioned myself getting a teaching degree and teaching in a school. After getting that degree, I got a full-time job at a United Methodist church working with their weekday children’s ministry. During that time, my father was diagnosed with prostate cancer and in about eight months would claim the promise of the resurrection. Those eight months would send me into a whirlwind of thinking and rethinking my vocational call. The reality of death and loss hit much harder than Bambi losing his mother ever did. Me on my wedding day with the window dedicated to my dad. In June of my first summer as a Youth Director, I took a small group of youth to Durham, North Carolina for a youth work-camp. The work crew that I was assigned to worked on the home of an elderly African-American woman who had adopted two teenage girls and was battling cancer. I had resolved, subconsciously, not to get attached. I did not want to experience the grief and pain that I had just experienced through the loss of my father. During lunch on that first day, the youth on the crew had invited the home owner to eat with us and join us for our devotion time. The youth had decided that we would eat lunch in her bedroom because she was unable to move freely on her own. I was the last one to enter the room, and when I did, the home owner announced, “There’s the minister!” I was quick to correct her that I was a not a minister, and she was quick to correct me that I was. “When you walked passed me this morning,” she said, “I felt the Holy Spirit move through you.” Not sure how to respond, I politely said, “Thank you,” and sat with the youth for lunch and our devotion. When I was in middle school, a friend of my Dad’s brought a collie to our house. He had found her on the side of the road, hit by a car. He took her to the vet. He couldn’t keep her because of the apartment he lived in, so he brought her to us. He had named her Penny. 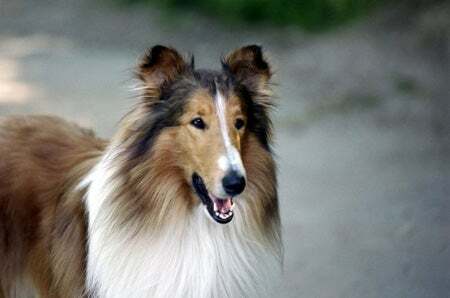 Penny looked just like the famous collie, Lassie, just a lighter shade of brown. Over the years, Penny would be there to see us get on the school bus each morning and to welcome us home each day. My senior year, our marching band trip was to Walt Disney World. My Dad was going as one of the chaperones and we were leaving the house to go to the school. It was that part of the day when evening was coming on. The sun was slowly slipping away and the moon was slowly rising to takes its place. Penny was nowhere to be seen. I remember thinking that this was odd. She was always around. She always there to greet us or to see us off. But on this evening, she wasn’t. Something deep within me knew that something wasn’t right. I called her name, “Penny! Penny!” Nothing. No bark. No collie feet running through the woods. Nothing. The strange feeling I had that something was wrong wouldn’t leave me. I called again. Still nothing. My Dad was urging me to get into the truck. We were going to be late. It would be ok, he said, she’ll find her way back. I kept calling. Then, I heard something. I asked my Dad, “Did you hear that?” He said he didn’t. I called Penny’s name again, and the sound of faint bark could be heard. Soft, quiet. Something was indeed wrong. I took off running, despite the cries of my Dad telling me to wait or to get a flashlight. Back behind our house was a huge creek that would run into the Pamunkey River. There was a trail from our house to the creek and another trail that would lead to my grandparents’ home next door. I ran, stopping every so often to call Penny’s name again, listen for her bark, and then run in that direction. I ran down the path, jumping over dead logs. I crossed the creek using the old oak that had fallen in just the right place to serve as a bridge. I struggled to get up the steep hill using weeds and branches to pull myself up it. I reached the top and there was this old abandoned house. No one had lived here for years. Windows were broken. Doors were missing. It looked like something out of a horror film. As I ran around to the front of the house, I stopped to see Penny standing on the roof of the porch. Without a moment of hesitation, I ran into the dark house, up the stairs, and found the room whose missing window, Penny had walked through. I called her to me, and she came back into the house and together we ran out of the house, down the hill, across the old oak bridge, and up the path back to my house. Somewhere in the midst of this running back, we bumped into my Dad would was coming after me with a flashlight. But, we didn’t stop, we both kept running until we made it home.